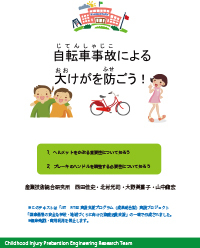 It is stated bicycle accidents are at most of accidents occur to primary school students (From Safety Knowledge Recycling Society Construction Report in 2008). 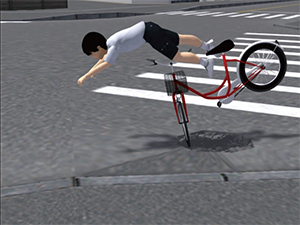 Comment on key points of preventing serious injuries in a bicycle accident based on the scientific data. inspect places where injury is easily causes in bicycle accident, make people aware of the importance of bicycle helmet use by the accident example that caused serious injury. the importance of brake adjustment is confirmed by the experiment of mechanism of controlling brake force adjusting to child growth.